We were in the car for two and a half hours already. Howard, me, the three boys, Smiles, our bearded dragon and two salamanders we had hijacked on our last visit, who we now intended to return to the wild. The boys had played their video devices and watched a movie. It was time for the badgering to begin. “Are we almost theeeeere??? ?” Michael whined loudly. “About 20 minutes.” I called back. 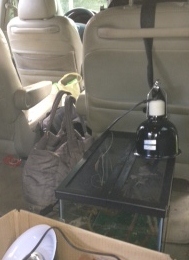 Smiles tank was precariously positioned in between seats and luggage, with an overhead heating lamp plugged into the cars’ adaptor hanging over it, since it should never be below 80 degrees. Howard had been randomly calling for checks on Smiles every five minutes or so. “Lizard check!” Howard yelled again. “I just want to be there!” He howled. We were stopping at the next exit whether he liked it or not. Already I could feel a restless excitement, my mouth watering in anticipation. It was like, how you can hold in your pee until you finally get to the door of your house, but then the urge becomes unbearable. Getting your keys out, opening the door, it’s almost as if there’s no way you can hold it one more minute when you’ve been holding it for an hour. That’s how I felt one exit away from Twin Cone, my country crack. 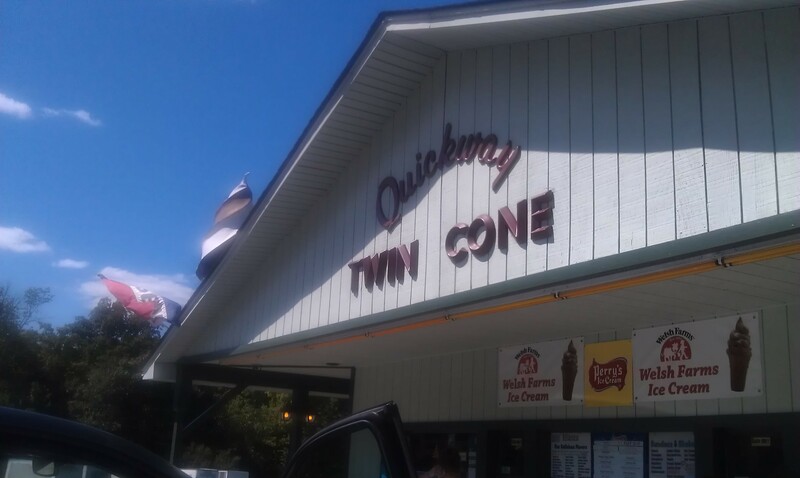 Twin Cone is one of those off-the-highway, stand-alone ice cream joints that scream 1950. It has flavors like Panda Paws and Play Dough. We pulled in and I took everyone’s order. My family is too lazy to even get out of the car. The waitress must deliver the goods to their waiting hands. Michael decided it was too much work to even go to the bathroom. I get in line and tap my foot impatiently till I finally place my order – a cup of vanilla, a cone and a cup of peanut butter chocolate chip, a Play Dough, a Sponge Bob pop and sides of chocolate sprinkles and crunch. I run each ice cream over to the car as it’s completed. I also try a sample of low-fat chocolate yogurt. 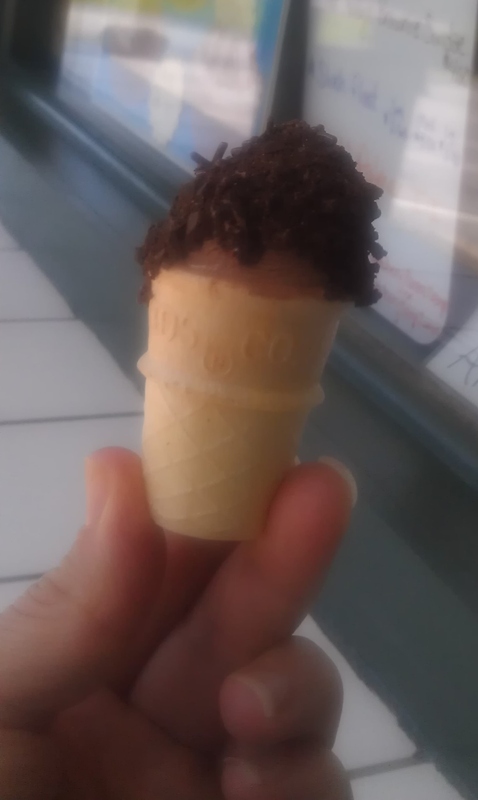 It is adorable on a mini cone, but tastes borderline disgusting. I dip it in sprinkles and eat it anyhow. I’m not one for waste. I settle in the car, positioning my cup and the side of topping for optimal dipping. Everyone is busy licking and getting sticky. I place a spoonful in my mouth and let it melt on my tongue. Ah. I’m ready for another hit when Tyler asks for water. I pass it back and go for my spoon again. “Mommy! It’s dripping!” Julius calls out and I place my ice cream down to rummage through my bag for wipes. I clean his lap and then his face. “I need one too!” Tyler says. Why does my 10 year-old look worse off than the 4 year-old? “I’m good” Michael says, by far the neatest of the three. “Can you check on Smiles?” Howard requests, apparently his scheduled “lizard checks” from the boys not sufficient. His cone is almost polished off, while I’ve barely begun. Checking on Smiles would require a trip to the back of the mini-van, kind of like walking through an airplane mid-flight with everyone’s luggage stored in the aisles. “Can I eat my ice cream first?” I snap. There was a rising pool of melted vanilla around the edge of my cup that was making me edgy. My crazy needed to be fed. After an exaggerated “why do I have to do everything” grimace, he hands it over where I place it safely in the garbage (Howard). I get two spoons in before the calling winds up again. I’m about to explode, but decide to just ignore everyone and drink my ice cream. I stir in some sprinkles. It is cool, creamy goodness. I’m not answering anyone for a few minutes. I’m on a break. “Are we almost there? !” Michael whines. “Who wants to go river rafting? !” He booms. Everyone in the back seats begin to cry. I continued eating. There was nothing I could do anyway. We were almost at the bungalows. The fun was just getting started. Posted in Bungalows, Ice Cream and tagged are we there yet?, bearded dragon, bungalows, humor, ice cream, lizard, long drive with kids, Yeah write. Bookmark the permalink. LOL I have been there done that! Even down to eating it, though I didn’t like it. I am always LOLing while reading your blog! You and your 4 boys (including Howard) are so amazing!!! May Almighty keep ya all happy and safe. Amen. I was right there with you about to explode! I love the image of you yelling “I’m on break” in your head! Completely relate – let me enjoy my two-minute respite/snack in peace! So funny and universal. now that i’m writing stuff down, i’m noticing a theme and it’s not pretty – crying boys, stressed mom, crazy husband. hmmm… no wonder i eat so much ice cream. Turns out, steak frites works alright. Ah, Quebec! Just please promise to help me run it off when I get back. And enjoy the bungalows with the boys! I drugged my kids on road trips – with individual portable DVD players. I felt guilty, almost. it’s all about survival, baby. Oh good grief this is so funny and so true!!! We only have one but we still live this reality. How is that possible? I have no idea. But I sure do love ice cream. Hahahah you need a martini. I agree with Larks – the Lizard Checks were hilarious! I thought Howard was one of the kids until he was the driver, though. The ice cream sounds like heaven. And yes, you deserved that break!! hahah oh my. This is the very reason we have not gone on vacation yet with our little ones. wait!! i swear. when we went to disney – 3 times so far! – the only ones who were really into it, was me and my husband. we are gluttons for torture! my next post tomorrow is on the river raft that we took. miserable!!! why do we do it???? Ice cream = nirvana. And not the suidide-y Kurt Cobain nirvana. Every time we get in the van to go any further than 30 minutes away I want to pull my hair out, strand by strand until we get to our destination. So much frustration when you’re trapped in the car with kids. Lizard check — too funny! Hilarious post! I think we’ve all had trips like this. Loved the line about your crazy needing to be fed. An ice cream stop (for Mom) should be mandatory on all road trips with small children. Love this post I totally relate. This was awesome but I kept waiting for the lizard to end up escaping!! Or in ice cream. I trust it was liberated in the appropriate spot? Good for you for tuning it all out for a rare moment of peace! It was the experience that got me back into writing. Sooooooo bad!!! Oh my lord, oh my lord, that is a nightmare! You hilariously captured every bit of it 🙂 Great post!! Loved lizard check and you calling your break to “drink” your ice cream. I hope it smoothed out by the time you reached the bungalows. I wanna go river rafting! Very funny story. 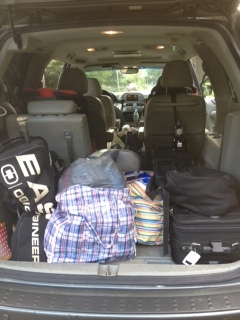 Oh the joys of family traveling. We once took our two girls on a cross country drive. Between the whining and the smell of stinky girl feet I wanted to throw myself out the door at 60 mph. Fun post and the ice creams sounds to die for! This is so funny. I love that the lizard is named Smiles. And I only realized at the end that Howard is your husband. Lizard check! And the fun is just getting started. A really nice show don’t tell story! I enjoyed it. my first post is me losing Smiles. it was so terrible it re-started my writing… so i guess it was good. it’s, “mom gets lizard. mom loses lizard. I dreaded long car drives as a kid and pretty much still feel the same. Some well deserved ice cream would definitely brighten my mood. Unless a lizard popped up in my Play Dough. Send them over for a trip in the Australian Outback…TomO will take care of it all, ever since he was real young, whenever he got in the four-wheel drive, he didn’t know if he was going to the corner store, or the other side of Australia…and loves it!